Mahalinga Swamy temple in Thiruvidaimarudur is located 8Km from Kumbakonam and is one among the three important Saivite shrines in India. Thiruvidaimaruthur temple is considered as holy as Varanasi.The temple with its imposing gopuram is one of the Panchalinga kshetrams as there are five lingams, four of which in the four cardinal directions and the fifth one MahalingaSwamy being at the centre. The temple of Viswanathar is situated in the east street, Rishipuriswarar in the west, Atmanathar in South street and Chokkanathar in North street. 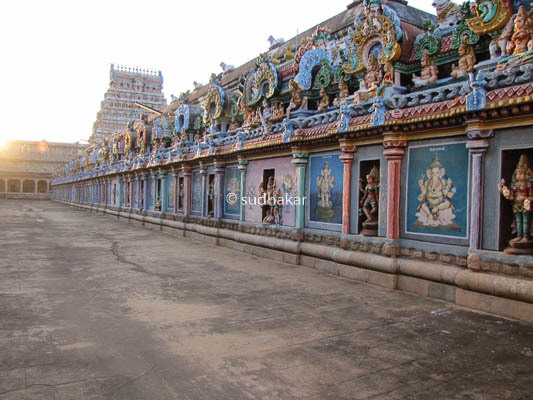 The temple is huge with a five-tiered Rajagopuram and three praharams (circumambulatory paths), each enclosed inside huge walls namely,Aswametha prakaram, Kodumudi prakaram and Pranava prakaram. Pradkshinam (Going around) Aswametha prakaram will is equivalent of performing aswametha yagam, Pradkshinam (Going around) Kodumudi prakaram is equivalent to going around Mount Kailash, and Pradkshinam (Going around) of Pranava prakaram will bring moksha. 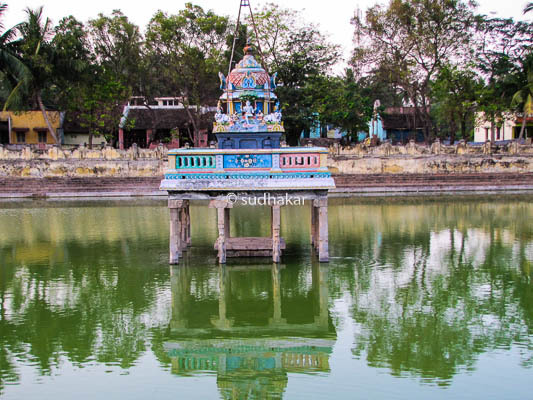 There are five temple tanks inside the temple, namely Karunyamirdha Theertham, Soma Theertham, Kanaga Theertham, Kalyana Theertham and Iravatha Theertham. There is a separate shrine for Mookambiga which resembles the Kollur Mookambika temple. The central shrine of the temple is that of Mahalingaswamy facing East. 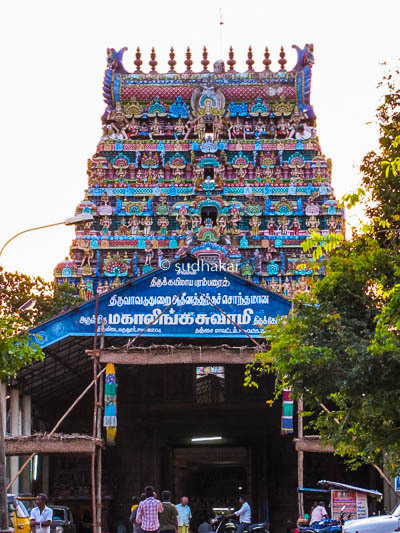 The shrine of Ambal faces the east and is situated close to the Mookambigai Amman shrine. 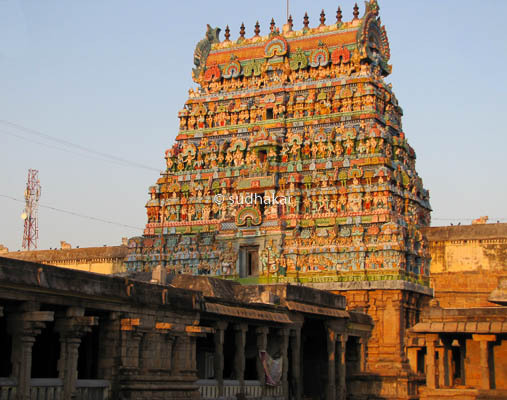 According to legend,Thiruvidaimaruthur Mahalingaswamy is the centre of all Siva temples in the region and the Saptha Vigraha moorthis (seven prime consorts in all Siva Temples) are located around the temple,in various parts of the state.The seven deities are Nataraja in Chidambaram, Chandikeswarar in Tirucheingalur, Swetha Vinayagar at Tiruvalanchuzhi, Swaminathan at Swamimalai, Bhairava in Sattainathar Temple at Sirkali, Navagraha in Sooriyanar Temple at Suryanar Kovil and Dakshinamoorthy in Apatsahayesvarar Temple, Alangudi. 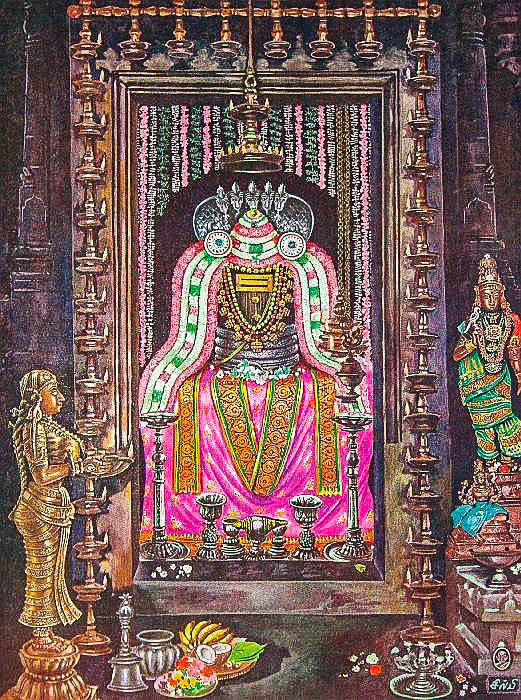 Mahalingam here is Swayambu and is the presiding deity with his consort Brihatasundaragujambigai also known as Nanmulainayaki. The Siva linga is also considered as Jothirlinga and Sakthi shrine is also known as one of the Sakthi Bheetams. Chakra Maha Meru is installed in this shrine. Thiruvidaimaruthur is one of the three Siva temples in India which adopt Maruda tree (Terminalia arjuna - commonly known as arjuna) as their Sthala vriksham (holy tree ) and hence it is called as Idai Marudur ( Madhyaarjuna). The other two Siva shrines are Thalai Marudur or Mallikarjuna temple in Sri Sailam, Andhra Pradesh and in Thiruppudaimarudur or Kadai Marudur( Sputarjuna) in Ambasamudram, Thirunelveli district. According to historical records once king Varaguna Pandiya’s horse accidentally killed a brahmin. This brahmahathi dosham sin followed wherever he went. The king sought asylum in Lord Mahalingaswamy temple. He entered from the front entrance and prayed to Mahalingaswamy and went out of the rear entrance. The Brahmahathi was still waiting outside the entrance for the king to come out and could not catch him again. The king was relieved of his dosham. It is said that people inflicted with mental disorders are cured by doing pradakshanams (going around) in the temple praharams.There is a sculpture of Chola brahmahathi in one of the inner gopurams on the eastern side. Tiruvidaimarudur is the birthplace of Saint Pattinathar. Apart from the daily ritual poojas that are performed four times a day,there are weekly rituals like somavaram and sukravaram, fortnightly rituals like pradosham and monthly festivals like amavasai (new moon day), pournami (full moon day), kiruthigai and sathurthi.The most prominent festival of the temple, Thaipoosam, is celebrated for ten days during the month of Thai (mid January). The utsavar (festival deity) of Mahalingeswarar and his cosorts circumambulate the temple and the streets in the village in different temple cars. The festival ends with Theerthavari on the last day. During the Tamil month of Vaikasi (Oct-Nov), Tirukalyanam, Ambal Tapasu festivals are celebrated. The temple Ther (Temple Car) is one of the biggest in Tamilnadu. It measures 89 feet from top to bottom . The Ther was donated to the temple by Amarsingh’s son Pratap singh Simha in 1800 AD. How to reach?The temple is located at 8 Kms from Kumbakonam. Plenty of local buses,cabs and auto rickshaws are available from Kumbakonam. Places nearby Kumbakonam is a place with many famous temples and Oppiliappan temple, Patteeswaram Durgai, Darsuram, Thiruvalanchuzhi,Thirubhuvanam,Swamimalai are very nearby. Contact Sri Mahalinga Swamy Temple,Thiruvidaimarudur - 612 104.